Home » Academics » Schools » School of Science, Engineering and Technology » Faculty » Audrey Hager, Ph.D.
Audrey M. Hager, Ph.D., loves how the brain, neuroscience and biology research can give rise to powerful insights into behavior. She imparts this enthusiasm and love of science to inspire undergraduate students to question and understand their own physiological functions within themselves. Hager received her B.A. double-majoring in Cognitive Science and Information Science from the State University of New York at Oswego. Continuing her love of learning, she received an M.S. and Ph.D. in Psychology concentrating in the field of Behavioral Neuroscience from Queen’s University in Kingston, Ontario, Canada. Hager’s early research involved examining the neurobiological mechanisms responsible for processes of visual learning and memory, where she discovered a novel form of metaplasticity in the visual system. 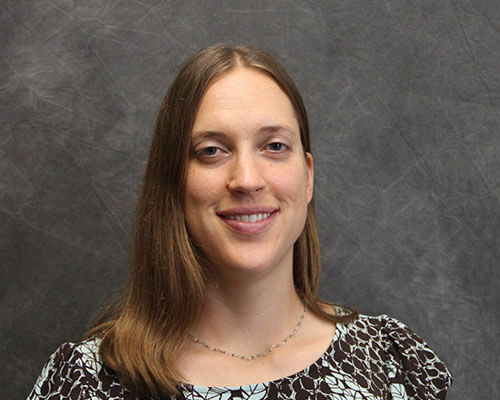 During the last two years of her graduate work, Hager was a visiting assistant professor in the Psychology Department at Oswego State, teaching undergraduate courses in research methods and biopsychology. It was the promise of excellent research and warmth all year round that drew Hager to San Antonio. She completed postdoctoral training at the University of Texas Health Science Center in the Department of Cellular and Integrative Physiology under the mentorship of Michael Beckstead, Ph.D., and Lynette Daws, Ph.D. As a trainee with the Addiction Research Treatment and Training Center of Excellence, Hager has applied her knowledge of biological mechanisms relating to neuroplasticity to the study of how the brain is altered with addiction. She was awarded an F32 grant in 2017 to examine how cocaine alters different dopamine neuron pathways of the midbrain. At St. Mary’s University, she is continuing her neurophysiology research to examine how the brain is altered following addiction using electrophysiological, pharmacological and behavioral techniques. She is currently using EEG to measure human brain states and examine the modulatory role of dopamine in processing reward. Hager AM, Gagolewicz PJ, Rodier S, Kuo M-C, Dumont EC and Dringenberg HC. 2015. Metaplastic up-regulation of LTP in the rat visual cortex by monocular visual training: Requirement of task mastery, hemispheric specificity, and NMDA-GluN2B involvement. Neuroscience, 293, 171-186. doi 10.1016/j.neuroscience.2015.02.027. Hager AM and Dringenberg HC. 2012. Design of a noninvasive face-mask for ocular occlusion in rats and assessment in a visual discrimination paradigm. Behavior Research Methods, 44, 919-923. doi 10.3758/s13428-012-0219-8. Hager AM and Dringenberg HC. 2010. Training-induced plasticity in the visual cortex of adult rats following visual discrimination learning. Learning and Memory, 17, 394-401. doi 10.1101/lm.1787110. Hager AM and Dringenberg HC. 2010. Assessment of different induction protocols to elicit long-term depression (LTD) in the rat visual cortex in vivo. Brain Research, 1318, 33-41. doi 10.1016/j.brainres.2009.12.063. Hager AM. (2017). Projection-specific dopaminergic neuron plasticity in the midbrain and the effects of cocaine. Ruth L. Kirschstein NRSA Individual Postdoctoral Fellowship (F32).